Topline lengths 21", 22", 23". Width38". Foam insets under the seat only. Adjustable billet strap retainers. Girth guides. Top Velcro closure for easy removal of foam insert and laundering. Cloud Nine pads have been developed under the most severe conditions and exhaustively tested over three decades in fox hunting, eventing and hundred-mile rides. Each Cloud Nine pad consists of two elements: THE CLOUD is a foam insert made to our specifications combining all the properties we find effective: -Density, thickness and elasticity attain maximum lateral pressure distribution and relief of discomfort to horse and rider. This pad is only available in NATURAL. 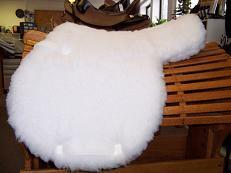 THE CLOUD COVER is handcrafted of washable, long-fiber hospital-quality polyester fleece which will hold its loft. It contributes to cushioning and comfort, to cool air circulation, and is easy-care, long-wearing. The velcro closure enables the CLOUD to be removed so the CLOUD COVER can be machine washed and dried.